I love this vintage Nintendo poster so much, put out by a desperate Nintendo of America Inc, way back in 1990. Such a classic, and shows how times change when it comes to brand names becoming nouns. 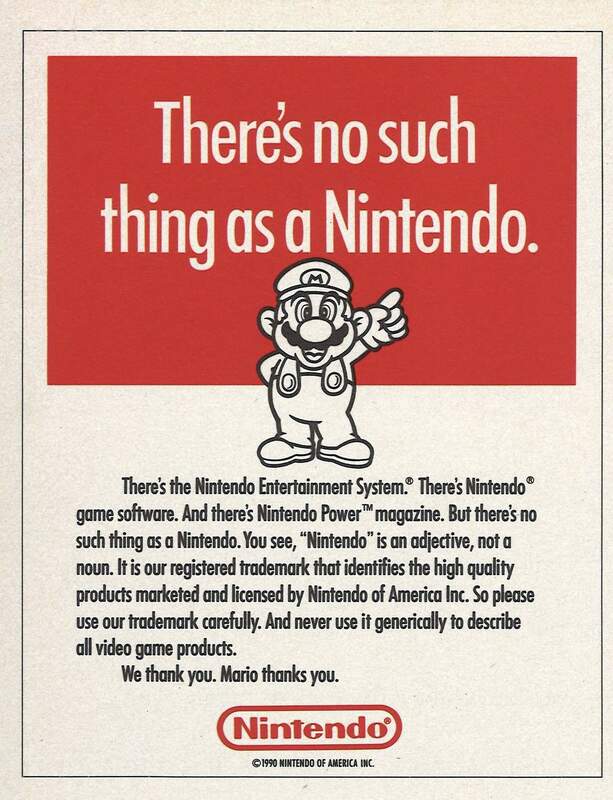 You see, “Nintendo” is an adjective, not a noun. There’s the Nintendo Entertainment System.® There’s the Nintendo ® game software. And there’s Nintendo Power TM magazine. But there’s no such thing as a Nintendo. It is our registered trademark that identifies the high quality products that marketed and licensed by Nintendo of America Inc. So please use out trademark carefully. And never use it generically to describe all video game products. We thank you. Mario thanks you.